What do trilobites and wiwaxia have to do with particle physics? Nothing. But David Boehnlein doesn't care. 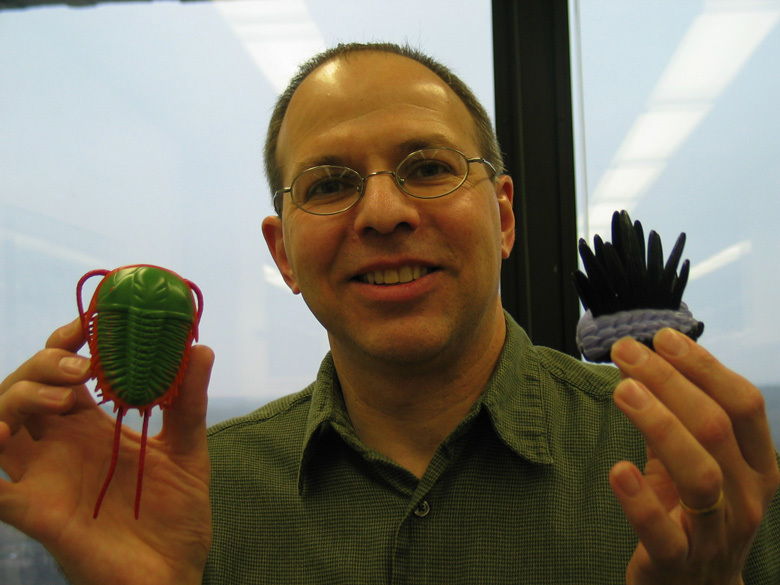 He's a neutrino physicist at Fermilab, and he's recently become a docent at the Field Museum's new exhibit, "Evolving Planet." The exhibit, which opened last Monday, includes videos, interactive displays and 13,000 fossils that take the viewer on a journey through 4 billion years of life on Earth. It has been described as the most comprehensive museum exhibit devoted to evolution in history. To become an Evolving Planet docent, Boehnlein spent every Saturday at the museum for 9 weeks, where he listened to geology and paleontology lectures and learned how to field questions from visitors. He says that he loved dinosaurs as a kid, but knew little about biology when he started. "What really struck me during the training was the amazing diversity of life--not only what we have today, but what we've had over time," he said. Boehnlien's favorite part of the exhibit is a Cambrian Sea Aquarium, a wall-sized digital reproduction of an ancient ocean, filled with creatures, like wiwaxia and trilobites, that lived 500 million years ago. The exhibit also includes the oldest known fossil of a eukaroyote (the first living cell with a nucleus), an expanded dinosaur hall and the world's largest collection of "tetrapod" fossils, which were the first creatures with limbs, toes and fingers. Boehnlein thinks the exhibit might be of great interest because of the rising tension between some scientific and religious communities. "It's not that religious questions are not as legitimate as scientific ones--it's just that those are very different kinds of questions that need to be answered in different ways. Whether it's global warming, stem cell research or nuclear waste disposal...science has to be part of the national discussion on these issues," he said. "I hope this exhibit can play a small role in making the case for that." Your alarm doesn't go off, so you figure if you eat your bagel while you race to work, you still might make it to 1 West in time for a 9:00 am meeting. It's also your aunt Peg's birthday, so you absolutely must call her from your cell phone before you pull into the Wilson Hall parking lot. Does some version of this story sound familiar? If so, it's time to make some changes. It's getting warmer outside, and roadwork is starting along a number of campus thoroughfares. If you drive too fast, or if you are distracted, you risk injuring someone. "Look for signs and slow down when you see people on the road," said Ray Fonseca, Fermilab roadworker of 25 years. Fonseca says it's common for people in a hurry to disregard roadwork signs and speed through construction zones. "People will often whiz right past us," he said. With a number of upcoming improvements that will place employees and contractors along or in roads, this will be a concern for everyone on campus. Besides pothole filling, there will be road shoulder grading, road power sweeping, work on clean catch basins along the road, and mowing along road shoulders. Vehicles that do not slow down when they see these activities create a serious safety issue. "We would ask that all drivers slow down and stay alert when they see 'Workers Ahead' signs, flashing lights or workers wearing high visibility clothing on or along side of roadways," said Mike Becker, head of FES Site Services. "Our workers can't protect themselves from cars, please remember to be careful." Bangalore: An unusual machine now being developed through international scientific collaboration may answer questions about some of the deepest mysteries in the universe, such as what is the nature of mass, are there extra dimensions and what is the dark matter that makes up 95 per cent of the universe? While in India, we visited some of the laboratories of their Department of Atomic Energy (DEA) and also had an extensive meeting with the Head of the Department of Atomic Energy, Dr. Anil Kakodkar. The DEA and Dr. Kakodkar have been much in the news in connection with the visit of President Bush and the agreement on nuclear cooperation between the US and India. The laboratories were fascinating. In many ways they resemble DOE labs. The Raja Ramanna Center for Advanced Technology (RRCAT), under the leadership of Dr. Vinod Sahni, is located in the outskirts of Indore. It is what we would call a multi-program laboratory. 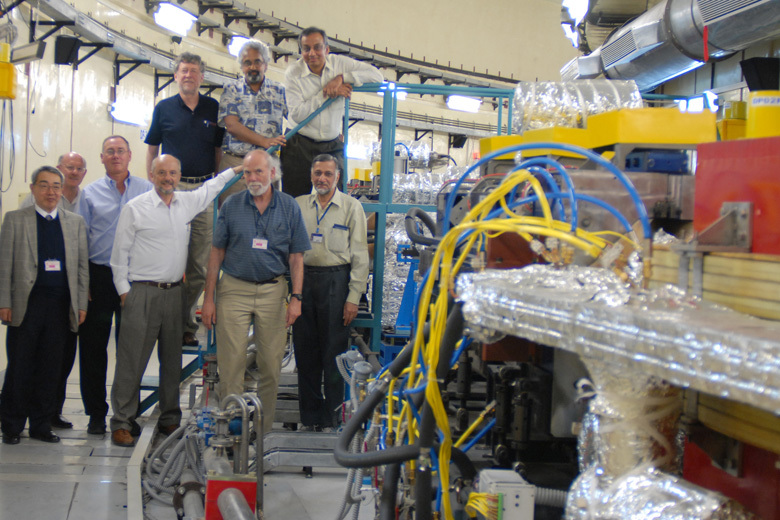 Among other programs, it has completed and is commissioning a 2.5 GeV synchrotron light source, INDUS II, that will eventually support an extensive program in material sciences, chemistry, atomic physics and biology. With the exception of a couple of components, INDUS II has been built entirely in India. The facility is beautifully laid out and very spacious. The cost of building such a facility in the US would be a factor of five to ten greater if the cost were expressed in dollars. The Indian policy to be self-reliant and to build high-technology components indigenously has created capabilities for India to collaborate in international projects. Notably RRCAT has been involved as collaborators in the LHC, building the corrector magnets and the precision jacks used in all the magnets. Another extraordinary laboratory is the Bhabha Atomic Research Center (BARC), directed by Dr. S. Banerjee in Mumbai. BARC is a legendary laboratory in India, having led the development and use of atomic energy. Today it is also a multi-program laboratory. There are several reactors on site. We were able to visit one of them, the Dhruva reactor designed and built in India, with an extensive program in neutron scattering applied to a variety of disciplines. The laboratory is vast with 12, 000 employees engaged in nuclear physics, material sciences, biological sciences and computing. We visited their computer center and saw an impressive visualization of a fluid dynamics simulation of the Indian Ocean Tsunami carried out with their 1.5 Teraflop supercomputer. Later this year they will have a 5 Teraflop massively parallel computer. The mechanical shops and engineering capabilities are vast. The laboratory has also collaborated in the LHC, building the pre-shower silicon detectors for CMS. In both RRCAT and BARC as well as other universities and institutes there is a keen interest to open new collaborations with the US and especially with Fermilab, where we already have valued collaborations in the Tevatron program with Dehli University, Panjab University and the Tata Institute of Fundamental Research (TIFR). We are fortunate to have the opportunity to explore such mutually beneficial efforts. Fermilab Folk Club Barn Dance Sunday, March 19 at 2 p.m. with music by Cats on Holiday and calling by Dot Kent. More info on the website. Do you ever wonder about the value of your benefits? The Benefits Office is providing you with a Statement of Benefits that provides information on your total compensation, your pay and your benefits combined. Watch your mailbox for this informative statement, which was mailed directly to your home address the week of March 13. Questions about your statement or your benefits can be answered by the Benefits Office staff. You may reach Kay Campbell at extension 3395, Scott Lindsey at extension 4362 or Mary Todd at extension 4361.